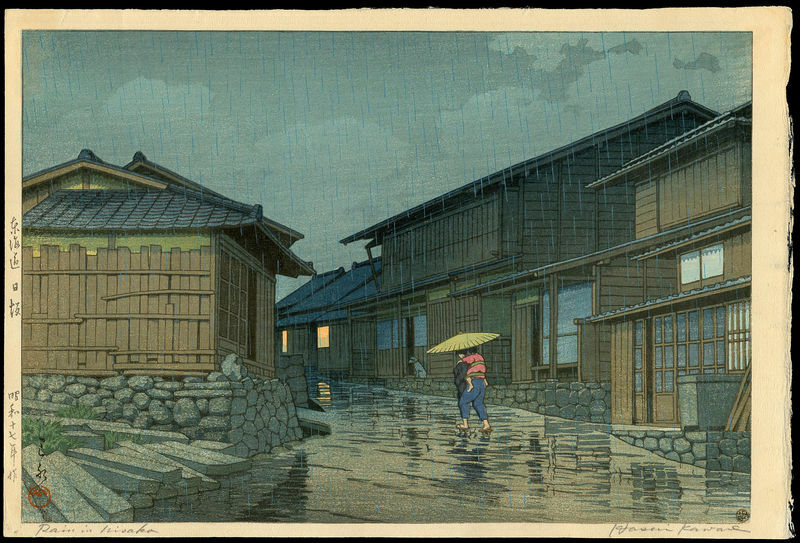 Hasui, Kawase (1883-1957) "Tokaido Nissaka" - Woodblock - Chinese and Japanese woodblock prints for sale, silkscreen, scrolls, watercolor, lithographs. Artwork Details for Hasui, Kawase (1883-1957) "Tokaido Nissaka"
Condition: Fine apart from some faint bleed-through of verso folder mounting paste at the top corners. Strong unfaded colours. Notes: Published by The Watanabe Colour Print Co.; Watanabe 6mm seal in lower right corner. This seal indicates that this print is a lifetime strike published prior to 1958.